The soundtrack for the film was released by Maverick Recording Company on Tuesday, 11/7/2000, and is now available where fine recordings are sold. The music in the film is usually one of the LAST things to be done before the film is "in the can". The artists to appear on the soundtrack are chosen first, and then the songs, plus the main orchestrations for the film, are put together, sometimes not finishing until less than 2 months before the film's general release (as was the case for The Rugrats Movie). LOS ANGELES, Aug 24, 2000 /PRNewswire via COMTEX/ -- Hold onto your berets, babies. Maverick Recording Company has announced the release of "RUGRATS IN PARIS", the star-studded companion album to the upcoming Paramount Pictures and Nickelodeon Movies animated adventure. 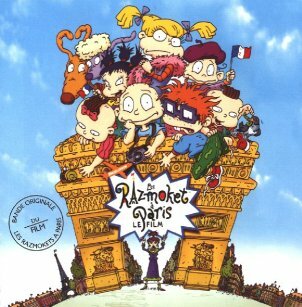 "RUGRATS IN PARIS-THE MOVIE" hits theatres nationwide November 2000. 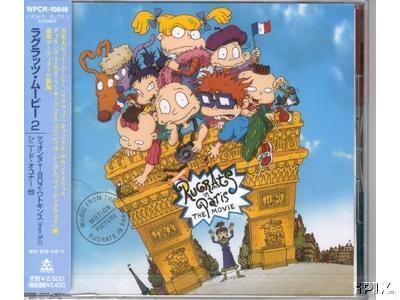 The "RUGRATS IN PARIS" soundtrack will be in stores on November 7. Maverick Recording Company has assembled a fun and eclectic lineup for the gang's international road trip, a blockbuster album that perfectly captures the dazzling colors and imagery of the Rugrats' big and bouncy world. "This is an extremely exciting project for us", says Guy Oseary, Maverick partner and co-producer of the "RUGRATS IN PARIS" soundtrack. "Rugrats is an international phenomenon and a favorite among animation fans of all ages. With that in mind, we've put together a really fun album, one that offers something for everyone." The "RUGRATS IN PARIS" soundtrack boasts a critically acclaimed, multi-platinum roster of both global superstars and up-and-coming buzz bands. Featured artists include Baha Men ("Who Let The Dogs Out") the hit single which is currently climbing the charts, TLC vocalist Tionne "T-Boz" Watkins ("My Getaway") and Sinead O'Connor ("When You Love" -- produced by Wyclef Jean.) Says George Acogny, the film's music supervisor, "Sinead's 'When You Love' summarizes the whole film. It's an emotional ballad written specifically for the movie, and truly shows Sinead at her best." Also featured on the album is Maverick recording artist Amanda ("You Don't Stand A Chance"). Amanda's debut album was co-produced by Scandanavia's Merlyn Music (98 Degrees, LFO) and is due out next spring. The Rugrats In Paris soundtrack also includes French multi-platinum artist Mylène Farmer ("Attrapez-moi! "), No Authority ("I'm Telling You This") and acclaimed composer / former Devo vocalist Mark Mothersbaugh. In addition to writing "I Need A Mom" for the soundtrack, Mothersbaugh composed the film's score. Says Acogny, "I've done many albums over the years, but putting together this soundtrack was the most fun I've ever had. Collaborating with Guy Oseary and Russ Rieger (Maverick Senior Executive) was great -- at times it felt like we were in a band together. The end result is a really great pop album whose appeal runs across the board." "Music has always been an important aspect of kids' lives and an integral part of Nickelodeon, and 'RUGRATS IN PARIS-THE MOVIE' is no exception", says Albie Hecht, President of Film and Television Entertainment for Nickelodeon. "The lineup of top contemporary recording artists involved in the Rugrats movie soundtrack further highlights Nickelodeon's connection with kids, families, and pop entertainment culture. We are especially thrilled to be working with a label like Maverick, which has allowed us to build our strongest soundtrack to date." The first single and video exclusively for the soundtrack will be Watkins' "My Getaway". "I'm a big fan of Tommy and Chuckie and the rest of the Rugrats, and I'm honored to be on this soundtrack," says Watkins. "The fact that I wrote the song makes this all the more special to me." The video stars Watkins, Tommy, Chuckie, and Angelica in a computer-generated clip directed by Christopher Urskin (R. Kelly, Brian McKnight). Meanwhile, "Who Let The Dogs Out?" by Baha Men is already a smash summer hit. Eric Heimbold (Brian Setzer Orchestra) directed the song's video. ©2000 Viacom.) Here's the final soundtrack order, and song selection. Bardot's "Higher Than Heaven" is available only on CDs made and distributed outside the US & Canada. 5. Baha Men: Who Let The Dogs Out? Here's the approximate order of the songs in the film itself, and where to find them. Songs in red do not appear on the soundtrack; songs marked with a " ** " are reprises -- songs played a second time around in the film. [ASCAP] Soulshock & Karlin Arista Records, Inc. (P) 2000 Arista Records, Inc.
James Dean Hicks New Nonpareil Music, Inc. Final Heartbreak Jessica Simpson Eric Foster White Zomba Enterprises, Inc.
(administered by Zomba Enterprises, Inc.) [ASCAP] Eric Foster White Columbia Records, by arrangement with Sony Music Licensing (P) 1999 Sony Music Entertainment, Inc.
Cutfather & Joe Music, Ltd. These Boots Are Made For Walkin' Geri Halliwell Lee Hazlewood Criterion Music Corporation [ASCAP] Steve Power Capitol Records, under licence from EMI Capitol Music Special Markets (P) 1999 EMI Records, Ltd.
Robert Casale (Issac Hayes Courtesy of Virgin Records America) (P) 2000 Viacom International, Inc.
Robert Casale (P) 2000 Viacom International, Inc.
Darryl Phinnessee Rightsong Music, Inc.
Sweet Summer Night Music [ASCAP] George Acogny (P) 2000 Viacom International, Inc.
(Exclusively licensed to Warner Music Australia) (P) 2000 Five Divas PTY Ltd.
1. Already becoming the most successful Rugrats song, Who Let The Dogs Out can also be heard on the Baha Men's album of the same name, in stores now. And for those of you in Canada, this song is also being used in a commercial for the Honda Civic automobile, though the ad has absolutely nothing to do with Rugrats. Who Let The Dogs Out has also become compulsory stadium music, played during most sporting events at arenas and stadiums; one key example was at game 4 of the 2000 World Series, where the Baha Men and Angelica appeared live at Shea Stadium in Queens, NY to sing a special version for the Mets -- Who Let The Mets Out (the Yankees won the series). The latest "Dogs" sighting was on 2/9/2001, when the space shuttle Atlantis was docking on the International Space Station. Currently, there are 2 versions of this video, with the original version NOT having any Rugrats material. The Rugrats version of "Dogs" can also be seen on both the VHS and DVD versions of the Rugrats In Paris video -- this way, kids can "let the dogs out" anytime they want (apart from the soundreack, of course). 2. T-Boz's My Getaway is also available as a single-track promo single, being distributed to radio stations by her label, Arista Records. The promo copies have T-Boz on the front of the case and the Rugrats on the back. 3. In France, Mylene Farmer's number, L'Histoire D'Une Fée, C'est..., has been released as a single in France. For details, click here. 4. Chicagoland musician Lisa McClowry will also be the voice of a Japanese princess in the film; she will sing in the Reptar musical, but her work will not appear on the soundtrack. 5. The CD version (US & Canada only) is an Enhanced CD, which includes special multimedia material that can be played on most computers. 6. Paramount and Maverick also issued special "For Your Consideration" CD singles of "When You Love" and "I Want A Mom..." to voting members of the Academy of Motion Picture Arts and Sciences, in hopes that one or both would be nominated for "Best Original Song" at the 2001 Oscars. Unfortunately, this plan didn't work -- the film wasn't nominated at all at the 2001 Oscars. 7. At left here is the Japanese version of the soundtrack; the covers are exactly the same as the US version, and the song selections are the same as versions sold outside the US & Canada. The only difference, though, is a special lable wrapped around the left side of the CD case, which announces the title, songs, price and other info in Japanese. By the way -- while the CD is now available in Japan, the release date for the film itself has yet to be announced.